With our 24/7 availability, 30 minute or less response times and local technicians that have years of experience, it’s clear why we are the top choice for your Round Rock Locksmiths. We are fully licensed, bonded and insured and you can count on fast, friendly services for all your lock and key needs for your home, car, and place of business. Don’t let a lost key or office lockout ruin your day. Just give us a call and of our local emergency locksmith experts will arrive at your location in less than half an hour. We will quickly fix your emergency lock situation so you can relax and get back to your day. We handle lockouts, key replacements, emergency repair services and more. Call us for simple car and trunk lockouts 24 hours a day. And, we can take care of more complicated automotive locksmith services too. Our mobile units in Round Rock carry the tools needed to provide car key replacements for all makes and models. We can even cut new laser cut car keys on the spot. 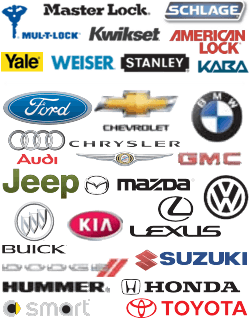 If you need ignition switch repairs or replacement transponder car keys made, we can do that too! Stress less knowing our 24-hour residential locksmith experts are just a quick phone call away. We handle home lockouts faster than anyone else in Round Rock and we can install or repair all of your home’s lock and key systems. Basically, if you need us to remove a broken key and replace it at 3 am we are here for you. Or, if you want to install a high-tech biometric lock system for your home, we can do that too! Protect your commercial property, your employees and your customers 24-hours a day with our installation and repair services for all types of commercial lock systems. We can install high-tech access controls and make sure your panic hardware is up to code. Don’t let your business suffer due to lockouts or faulty locks, call our commercial locksmith experts anytime!